SINGAPORE, June 8, 2018 - (Media OutReach) - The China sports market is experiencing a phenomenal growth in recent years. According to a Forbes report on 17 Jan 2018, the Chinese National Bureau of Statistics' official data on the growth of China's sport's industry for 2016, published on 13 Jan 2018, showed a total output of 1.9 trillion yuan ($295 billion), and an 11.1% growth that outpaced the recovering national economy. Since 2015, REBEL Fighting Championship (REBEL FC), with its headquarters in Singapore, has hosted several successful shows in Singapore. Due to REBEL FC's success in Singapore, we have expanded and begun operating in the more lucrative China sports market. REBEL FC hosts all its events with MMA stars from around the world with the goal of bringing martial arts back to its birthplace - China. 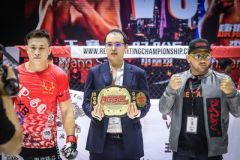 By bringing the biggest fights to China, REBEL FC provides a platform for Chinese MMA fighters to shine on the global MMA stage by pitting them against the best international fighters. To emphasize REBEL FC's intent to expand in China, the organization is hosting an event on 11 August 2018 at Beijing's National Olympic Stadium. Titled REBEL FC 9 - Battle for the Kingdom, it showcases the best MMA fighters China has to offer - Liu Wenbo, Wang Sai, Ning Guangyou and Wang Yayong - against the most seasoned international superstars who have competed at the very top of global MMA - UFC veterans Antonio 'Bigfoot' Silva (UFC heavyweight contender) of Brazil and Takeya Mizugaki (UFC Bantamweight contender and No.1 ranked Bantamweight in Asia) of Japan, Brazil's REBEL FC Welterweight (77kg) champion Adriano 'The Rock' Balby and Japan's REBEL FC Bantamweight (61kg) champion Shuhei Sakano, who defeated the No.1 ranked Bantamweight in China, Ayideng Jumayi in REBEL FC 7 - Fight for Honour.